Joe Mullen received a partial scholarship to Boston College and paid $700 out of his own pocket to attend. In his first year with the team he tallied 34 points in 24 games and earned a full scholarship the following year. How does a boy growing up in the concrete jungle of New York City ever go on to star in the National Hockey League, enjoying a career that eventually leads to the Hockey Hall of Fame? "My Dad and my uncles all played the game of hockey growing up. They used to play on rollerskates when they were younger," begins Joey Mullen, a native New Yorker born February 26, 1957. "My Dad worked at Madison Square Garden, too, so he had access to get us some sticks from pro clubs coming in. I could look out my window and see Madison Square Garden, which was half a block up the street from me. We had a schoolyard right across the street from us where we played roller hockey. So, the combination of all that gave me my love for the game." But Mullen's love of hockey didn't start with an old stick and a puck on a sheet of ice. "I was about ten years old when I started on ice skates. I was about five when I started on rollerskates," he explains. "To get into organized hockey leagues on rollerskates, you had to be seven, so I had to wait a couple of years. Roller hockey leagues were run by the Police Athletic League, the CYO (Catholic Youth Organization) and the YMCA." Like most youngsters, Joey had his heroes while growing up, but with his Dad working at Madison Square Garden, there was little doubt where his allegiance was found. "I watched Brad Park and Rod Gilbert and Vic Hadfield playing for the New York Rangers," Joey recalls. "When I got a little bit older, I watched guys like Rick Middleton and Don Murdoch come into the league." 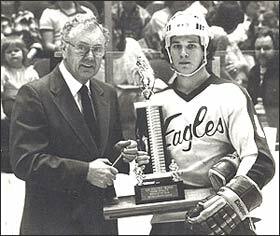 As a member of the Salt Lake Golden Eagles, Joe Mullen won the "Jim McKenzie Trophy" as the Central Hockey League's top rookie in 1979-80. The idea of playing in the NHL like his heroes never crossed the mind of the young hockey player. "We just enjoyed playing the game," explains Mullen. "It wasn't until I was about fifteen or sixteen that I saw some of the older guys, like my older brothers and their friends, going on to colleges and getting scholarships, so that's when I started thinking that maybe I can make it to that level." 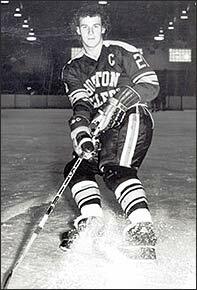 In 1975, Joey Mullen played hockey while attending Boston College, and was consistently one of the team's leading scorers during his four-year tenure with the Eagles of the ECAC (Eastern College Athletic Conference). In his final two seasons (1978 and 1979), Mullen not only made the ECAC's First All-Star Team, but was also selected to the First All-American Team in the NCAA East. "College was four of the best years of my life. It was a great experience," smiles Mullen. "I loved the college atmosphere and the college game. It was a great learning experience for me and it got me to that next level." Just prior to the 1979-80 season, the St. Louis Blues signed Joe Mullen as a free agent. Mullen quickly became a fan favourite and would spend six seasons with the Blues. Undrafted, Mullen was signed as a free agent by the St. Louis Blues on August 16, 1979. Joey was a well-known commodity to Emile Francis, the Blues' general manager at that time. "One day, when Emile Francis was running the New York Rangers, he decided to get out of the office and was just walking down the street and he saw these kids on rollerskates, so he followed them. He couldn't believe how many kids were playing roller hockey. He got the idea, 'Hey, if they enjoy the game on rollerskates, why can't we get them on ice?' He formed a junior ice hockey league in New York and got his bosses behind it and it grew into the New York Metropolitan Junior Hockey League. Everybody in my neighbourhood got involved in that league. I played with his youngest boy, Bobby, in that league. My two older brothers played against his oldest boy, Ricky. And Emile knew my Dad from Madison Square Garden. The NHL scouted the colleges, and I was at Boston and Bobby was at New Hampshire, so we ran into each other there. When I came out of school, the Blues offered me a contract." After a very strong season in 1979-80 with the Salt Lake Golden Eagles of the Central Hockey League, a season in which Joey was named rookie of the year and made the CHL's Second All-Star Team, he was summoned to make his NHL debut with the Blues during the playoffs that spring. "It was a little nerve-wracking because it was the playoffs, but I only had a couple of shifts," he remembers. "But there is no bigger thrill than pulling on an NHL sweater for the first time." To commemorate a strong, productive season with few 'indiscretions,' Mullen was awarded the Lady Byng Trophy, beating out Edmonton's Wayne Gretzky as the NHL's most gentlemanly player. After an MVP season with the Golden Eagles in 1980-81, Mullen became a full-time member of the St. Louis Blues in 1981-82, scoring 25 goals in just 45 games. "Brian Sutter, Bernie Federko, Rob Ramage and Blake Dunlop helped me make the transition to the NHL," he admits. "It was a learning experience. We had a fairly young team at the time. We grew together a little bit. It was a great experience to come in and have success early." The Blues went to the Division Final in 1982 and 1984, a season in which Joey hit the 40-goal mark during the regular season for the first of six times. 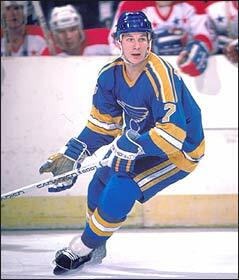 Then, on February 1, 1986, Mullen was traded to Calgary with Terry Johnson and Rik Wilson, while Eddie Beers, Charlie Bourgeois and Gino Cavallini went to St. Louis. "When I first got traded to Calgary, I was pretty upset about it because I was leaving St. Louis and it was my first trade and I didn't really know how to react to it," admits Joey. "I landed in Calgary and I couldn't have been treated any better up there. The people are great. The moment I stepped off the plane, people knew who I was. It was almost a scary feeling, because I was walking through the airport and people were saying, 'Hey Joey, nice to have you!' I thought, 'How do these people know who I am already?' Unbelievable! I couldn't get over it! It was almost like you're an instant celebrity." That season, Calgary went to the Stanley Cup final. "We lost, but that was a great learning experience. In St. Louis, you played just to see if you could make the playoffs. Once I got to Calgary, all they talked about was the Stanley Cup. Right from the start, it was, 'Stanley Cup! Stanley Cup!' It was unbelievable." During Mullen's first year with the Penguins he would record 17 points in the playoffs and help the team win the Stanley Cup for the first time in its history. Three years later, Joey led the Flames in scoring with 51 goals and 59 assists. His 110 points allowed him to finish seventh in scoring in 1988-89. He was selected to the NHL's First All-Star Team, was the NHL's Plus/Minus Leader and received the Lady Byng Trophy for gentlemanly play, something he had done two years prior, as well. That spring, after finishing first in the Smythe Division for a second straight season, the Calgary Flames claimed the Stanley Cup for their own. In the final against the Montreal Canadiens, Mullen fired 5 goals and 3 assists to aid his team, second only to defenseman Al MacInnis, who was selected as the Conn Smythe Trophy winner as the playoffs' most valuable performer. Following the 1989-90 season, Joey was dealt to the Pittsburgh Penguins in exchange for a second round draft pick. The idea didn't bother Mullen, unlike his first trade. "That was also a great experience," Joey says. "That got me closer to home, which was nice. My kids were getting a little bit older and I wanted to get them back into the States. But I also knew I was going to an excellent organization. (Hall of Fame coach) Bob Johnson was there and he had a lot of influence on getting me to Pittsburgh. Craig Patrick, too. They wanted me on their team and that was a great shot in the arm for me. I knew they had a good nucleus for a great team. They got Bryan Trottier just before they traded for me so I had a feeling they were headed in the right direction. I was pretty excited about getting there. Then there was the emergence of Kevin Stevens and John Cullen, and Mark Recchi really bolstered the team. Then, we had Paul Coffey and Mario and Tommy Barrasso, so we had a good group." Joe Mullen (left) was Inducted into the Hockey Hall of Fame in 2000. 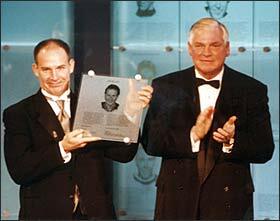 Mullen poses with his Honoured Member plaque alongside Chairman and CEO of the Hockey Hall of Fame, Bill Hay (right). In his first season wearing the Penguins' black and gold, Mullen and his teammates won the Stanley Cup. For a team that had teetered on the brink of bankruptcy, it was a sweet victory, and the first in franchise history. Joey scored 3 goals and 5 assists against the Minnesota North Stars in the final and was rewarded with his name engraved on the Stanley Cup for a second time. In 1991-92, Joey rebounded from an off-year from a productivity standpoint and fired 42 goals and 45 assists during the regular season to help lead Pittsburgh to a third place divisional finish. But the reward came at the end of that playoff season when, for a second consecutive spring, Mullen and the Penguins carried off the Stanley Cup. Pittsburgh swept the Chicago Blackhawks to take the championship. For Joey Mullen, it was the third and final time he'd be a Stanley Cup champion. After five seasons with the Penguins, Mullen was signed as a free agent by the Boston Bruins for the 1995-96 season. 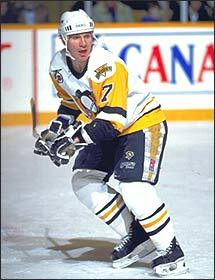 He returned to the Penguins as a free agent for the 1996-97 campaign, his sixteenth and final season, then retired from the game as a player. But just prior to concluding his career, Joey beat Patrick Roy of the Colorado Avalanche for his 500th career goal, a landmark tally that allowed Mullen to become the first American-born player to reach that prestigious plateau. At the time of his retirement, Joey Mullen was the NHL's highest scoring American player of all time. In 1,062 regular season contests, Joey scored 502 goals and added 561 assists for 1,063 points. He added 106 points (60 goals and 46 assists) in 143 playoff games. 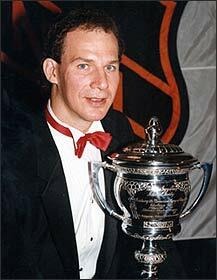 In 2000, Joey Mullen was elected to the Hockey Hall of Fame. "The build-up to that (Induction) weekend was crazy," recalls Joey. "It's constantly on your mind and that drove me nuts for a couple of months. The way the Hall of Fame puts on all the events was fantastic. Words can't describe it. Being able to go in with Denis Savard was a big thrill for me. The whole experience  you don't dream of these things. They happen to other people, they don't happen to you. Once it does, it was beyond my wildest thoughts!"